Even in the yacht scene which is well used to highlights, wonders never cease: the new Drettmann Explorer Yacht (DEY) can undoubtedly be classified as one of these wonder, simply because hardly any other new yacht combines luxury, comfort and innovation in such an exclusive way. 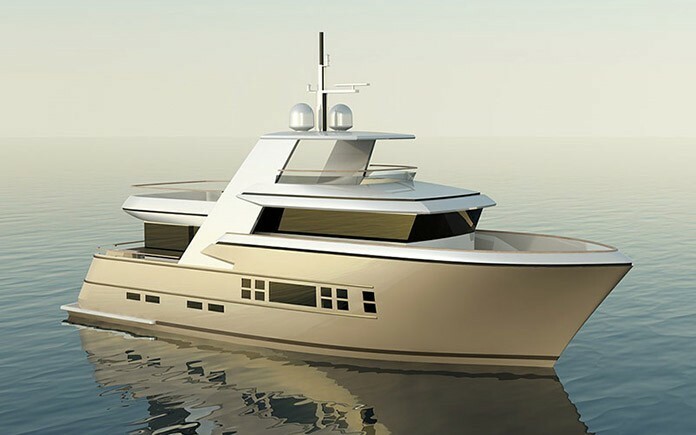 And as exclusiveness has been a traditional feature of Drettmann Yachts for more than 45 years, the DEY was no longer built in Taiwan like its predecessors, but in two countries which are regarded as the cradle of shipbuilding: the Netherlands and Germany. With 10,000 ships sold and 1500 new-build yachts, Drettmann once again delivers a quality that lives up to the acclaimed “Made in Germany” standards in every single detail. Of the numerous innovations on board, the most important is probably the diesel-electric POD drive system. 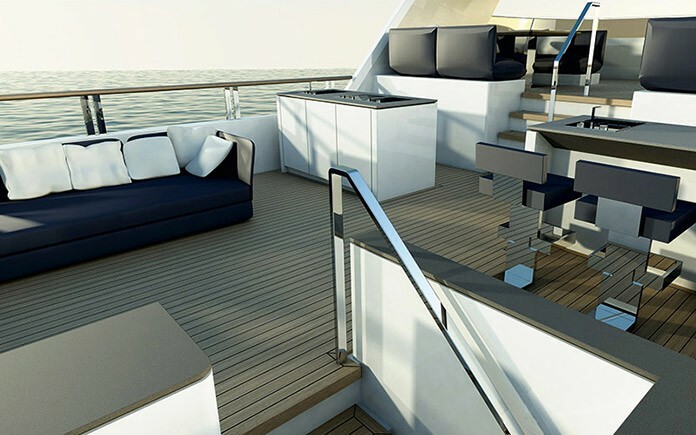 True progress that has a noticeably positive impact on many different aspects: from sailing comfort and optimum energy utilisation, to minimum vibrations, efficient use of space and ease of service. This makes the DEY sensationally easy to steer, with a joystick which enables the owner to handle even difficult mooring manoeuvres himself. Energy utilisation is significantly improved, whilst vibrations have been substantially reduced. The new drive system means that the engine room can be located under the forecastle deck. This frees up space on the lower deck, so that the guest cabins are now closer to the beach club (with sauna and lounge area) and the sea. The new line of the Drettmann Explorer Yacht with its striking appearance –compact on the outside and extraordinarily spacious on the inside due to offset levels –was created for owners, who above all want to own a proper ship. A vessel, whose elevated prow will repel splash water and waves far away. However, also a ship that leaves nothing to be desired in regard to storage space, for instance for diving equipment and jet skis. And additionally a vessel, which on the inside enables a stylish and comfortable life onboard due to its exclusive interior, selected by Claudia Drettmann in cooperation with the designer Birgit Schnaase. 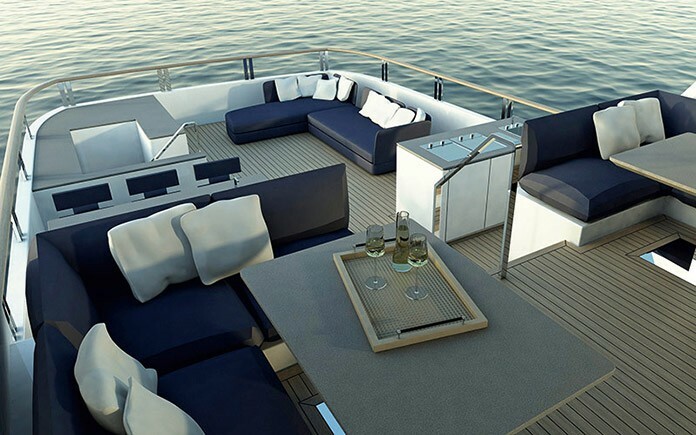 A particular highlight is the large, pleasant eating and living area on the main deck. 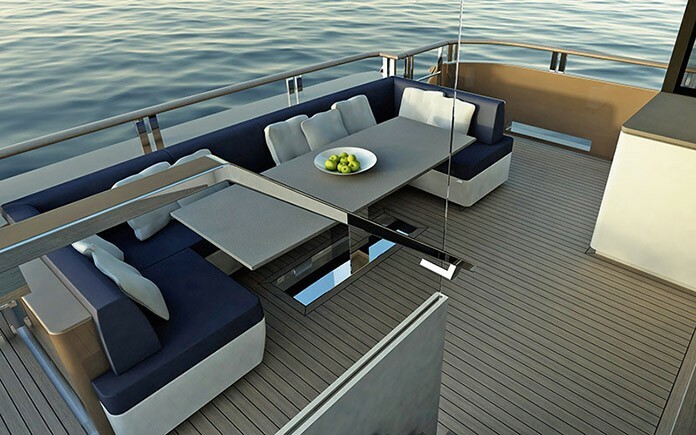 On top of the 54 m2 large flying deck there is an outside steering position, two couch areas, a bar with a BBQ and storage for deck chairs. The interior design by Claudia Drettmann in cooperation with Birgit Schnaase makes optimum use of the available space to celebrate a modern look combined with urban casualness, with accentuating eye-catchers such as a blood-red bar counter and Italian furniture. Drettmann has paid meticulous attention to these and all other functional or stylistic details, testing them again and again to guarantee that the owner can enjoy a perfect yacht experience for years on end. “To us, it is of prime importance not merely to claim the qualities of the new Explorer Generation, but to back these claims with experience. POD technology, for example, has already been successfully used in professional shipping for a long time. But we are the first company to use this system in a 24-metre yacht. This is a world premiere – and just one of many innovations of which we are justly proud,” says CEO Albert Drettmann. 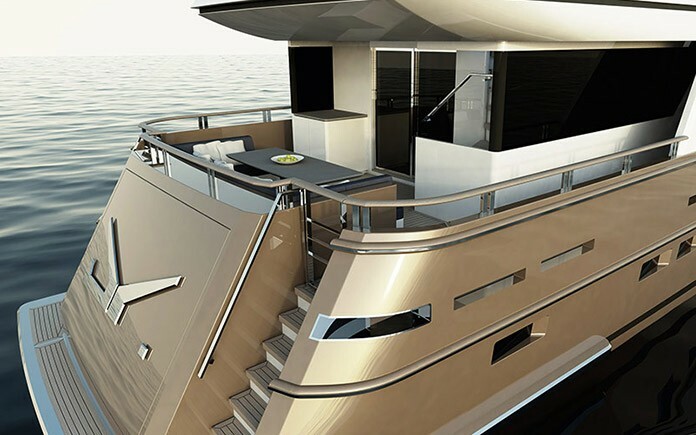 This is yacht design that captivates at first glance: the DEY exterior by Focus Yacht Design, with taupe hull and white superstructure, conveys a masculine, sporty, voluminous image, simply made for long trips on all the seven seas, for water sports and diving.